Bry-Air, the leaders in dehumidification… worldwide sponsored and facilitated the visit of 100 plus engineering students to ACREX 2016. The objective of the initiative was to connect young budding engineers to the HVAC&R industry and provide them hands-on exposure and learning to the latest in the field of heating, ventilation, air conditioning, refrigeration and building services. Bry-Air identified 8 engineering colleges from all over India and got interested students to visit ACREX 2016 held at Mumbai. 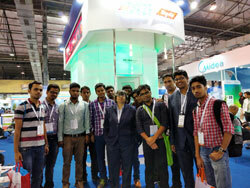 It collaborated with the industry partners and ensured the students visit was full of learning and opportunities. The students who were accompanied by their faculty got to interact and engage with key people from the industry, understand the latest technologies and relate practically to their studies. This is what one of the students part of the Bry-Air study tour initiative had to say – The event was very good. We got the chance to see the things first time out of the textbook. Very good experience when you join like minded people across the globe. I got lots practical knowledge out of this study tour. At the end I like to thank all Bry-Air people to provide us such wonderful opportunity. Rohan Tote, National Institute of Technology Karnataka, Mangalore. Mr. Deepak Pahwa, Managing Director, Bry-Air (Asia) Pvt. Ltd. present at the exhibition said – Bry-Air firmly believes in recognizing and promoting young talent; providing them opportunities to gain exposure and equipping them with the right skill set. After the success of 10 years of awarding students for their outstanding project on excellence in HVAC&R industry, we decided to take up this new initiative of study tour. We hope both the students and industry will benefit from this Bry-Air endevaour. Bry-Air was the silver partner at ACREX 2016 held from 25-27 February 2016 at Bombay Convention and Exhibition Centre, Mumbai, India. Having booth size of 180 sq. mtr. 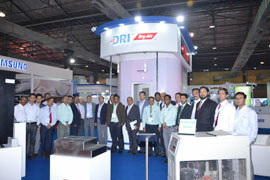 at Hall #1, C-2A, Bry-Air showcased its entire range of product offerings, providing end-to-end solutions in air treatment. The key highlight was the Adsorption Chiller – Energy smartcooling using waste heat. 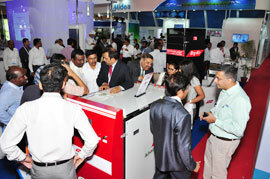 ACREX India organized by ISHRAE is South Asia’s largest exhibition on air conditioning, ventilation, refrigeration and smart buildings. In it’s 17th edition, the theme for this year was – ‘Make in India – Infinite Opportunities for HVAC&R and the Building Services Industry’ and received strong national and international participation and acceptance.